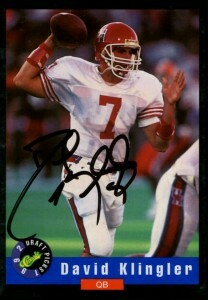 Acquired: TTM 1993, C/o The Cincinnatti Bengals. In Person 1996, Dallas Cowboys Training Camp. David Klingler was another in a line of Houston Cougar record-setting quarterbacks (Andre Ware) under the Run and Shoot offense. He’d set a then record with 11 touchdown passes and 716 yards in a game against Eastern Washington in 1990, winning the Sammy Baugh award after that season. David would also break Ware’s career passing records and set the NCAA record for touchdowns in a season (since broken) with 54. In 1992, Klingler would be the #1 pick of the floundering Cincinnati Bengals franchise with the 6th pick overall (right after Terrell Buckley). (Thinking in terms of quarterbacks that were from the 1992 draft, the only members of this draft to make the Pro Bowl ever in their careers were Brad Johnson and Jeff Blake.) The Bengals had a fresh new coach in Dave Shula, and he wanted a fresh, new face at quarterback along with him. This meant Klingler also had the very unenvious position of replacing extremely popular player Boomer Esiason at quarterback. Klingler in his rookie season would start 4 games under center for the Bengals posting 3 touchdowns to 2 picks, and throwing for an anemic 5.4 yards per throw. He’d also be sacked 18 times in 1992- a rate of a bit over 4 a game. 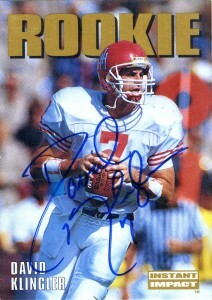 In 1993, Klingler was dubbed starting quarterback, where I’d send off through the mail to get his autograph. In 13 games, the Bengals allowed Klingler to get sacked 40 times, but he’d try to make up for it with his rushing ‘prowess’, running for 282 yards and a 6.9 yard average. He would only throw for 6 touchdowns to 9 interceptions. David would almost duplicate those numbers in 1994, starting in only 7 games and being sacked 24 times. 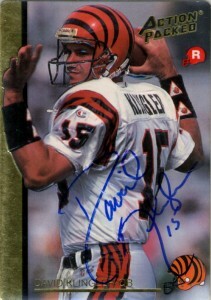 In 1995, he had a forgettable season with the Bengals and was released. Considered one of the many busts of the early nineties, Klingler never really stood a chance behind a patchwork line and in his first career game he was sacked 7 times by the Steelers. The Raiders would take a flyer on Klingler, where he played 2 more seasons and I got his autograph in 1996 at Dallas Cowboys training camp. After his 1996 season with the Raiders, he’d be signed by the Packers looking for competition behind Brett Favre, but he’d lose out in training camp and retire soon thereafter. Klingler since leaving the NFL has graduated with a Doctorate in Old Testament Studies from the Dallas Theological Seminary. He remains an avid football fan and backer of the University of Houston.